Preschool Playbook: Who Am I? Our first theme at nursery school is the traditional exploration of "ourselves." Who we are, what we look like, differences and likenesses to others, family, how big we are, etc. Just a general look at ourselves and those around us. This year I got an idea for a new project from one of my most favorite sites: Teaching 2 and 3 Year olds. At the beginning of the year in the school where the writer works, the teachers make posters about themselves to introduce themselves. I thought this was a great idea so I made one and had my aide make one. Then I thought what fun it would be to have the families make one of these for each of the children and we could discuss them as they came in and also hang them in the room for a while. My aide and I had a good time making ours, although we had quite a time finding a good picture or ourselves. Then on orientation day, I passed a 12x18 piece of paper out to all the parents. I showed them the poster that I made then asked them to sit down at home with their preschooler to make one to send to school. I know, I know--preschool homework! What am I thinking. I stressed not to get too elaborate, but to try to enjoy the project. Our ME BOOKS we make at school begin by having pages focused on: how big we are, who are the members of our family, and what we like. I asked the parents to focus on these things to make the poster. I told them they could use photographs, pictures from magazines, drawings, etc. anything they were comfortable with. We haven't gotten any back yet, I just gave the paper out last Tuesday, but I'll let you know how our response is. I also wanted to share this in case there are any parents at home looking for a fun project to do with their child. Every child at this age thinks they are the "greatest thing since sliced bread." It would be fun to help them make a poster of themselves to hang on the wall. Great idea for community building and providing a welcoming environment for the families. It shows them that they truly matter. 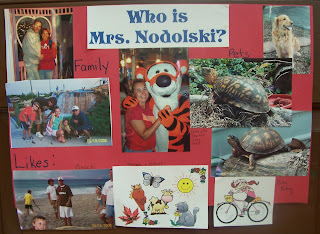 When I was teaching, I decorated the front of my desk with photos and pictures to help the kids learn about me. 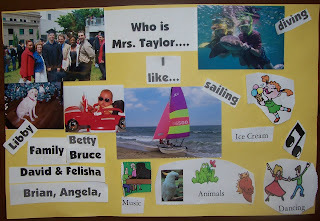 I would also have them create a SELF collage to share with the class. Thanks for listing me under your favorites! I posted some APPLE ideas today. I'm sure you probably have some that you could share as well with all of your expertise. Please stop by and comment if you have time! Jen at Creative and Curious Kids! Thanks for this wonder full n enjoyable idea... Keep comingup with such nice ideas.